According to the FHFA data, the first and second quarter of this year delivered the first year-over-year increase in the seasonally adjusted purchase-only house price index ()HPI)( since the first and second quarters of 2007. The second quarter registered a 1.3% inflation-adjusted price increase. Forty-three states experienced price increases. The two FHFA charts below show a distinct stabilization in prices. The chart of price changes shows an encouraging pattern of higher highs and higher lows that signifies a sustained trend upward from the bottom. The price index indicates downward momentum came to a screeching halt last yearת with 2012 building off that base. 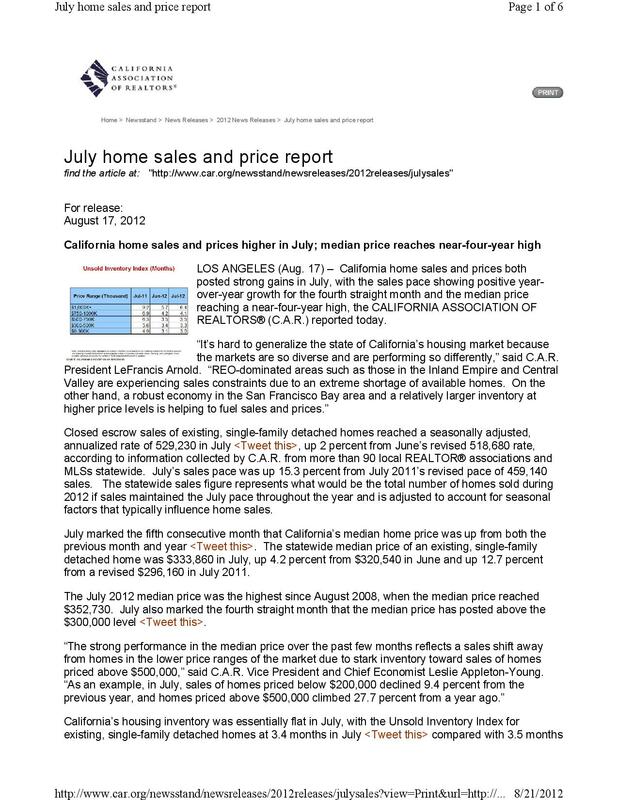 Higher home prices reduce California housing affordability in second quarter 2012. Higher home prices offset record-low interest rates and lowered housing affordability in California in the second quarter of 2012. The San Francisco Bay Area experienced the largest quarterly declines in housing affordability, resulting from double-digit price increases with little movement in theinterest rate. However, when compared with the previous year, changes to the affordability index were minimal, thanks to a near-one percent drop in the effective composite interest rate. The S&P/Case-Shiller home price index was released Wednesday, showing month over month strength and lower year over year weakness. Less weakness is strength in the housing market. Average home prices increased by 2.2% in May over April for both the 10- and 20-City Composites. Home prices fell annually by 1.0% for the 10-City Composite and by 0.7% for the 20-City Composite versus May 2011. All 20 cities and both Composites posted positive monthly returns. 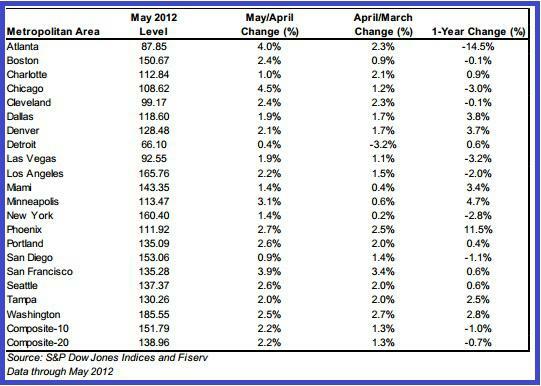 No cities posted new lows in May 2012. 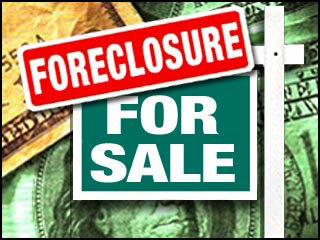 Riverside is the third California metropolitan area suffering from a sick housing market. In this region, homeowners paying a mortgage have $41.5 billion in negative equity, the fifth-highest amount in the nation. Many of these homes are under water because median home prices plunged by 55.6% from their peak in 2006. The metro had an annual unemployment rate of 14.3% in 2010, the highest among the largest cities in the country (it was 11.8% in May 2012), and 12.3% of homeowners with a mortgage are 90 or more days delinquent on their payments — the ninth-highest rate. According to Southern California’s City News Service, the assessed value of all taxable property in the county is estimated to be $204.8 billion for the 2012-2013 fiscal year, a $300 million decline from the $205.1 billion assessment in the previous fiscal year. While the decrease is lower than previous years, it means things have yet to improve.